Our Future Rooted in Our Past: Missing Irish Ancestors? Have you tried the Want Ads? Missing Irish Ancestors? Have you tried the Want Ads? Missing Irish Ancestors? Have you tried the Want Ads? Your ancestors may have tried to located their missing family members by the use of want ads in the local newspapers. 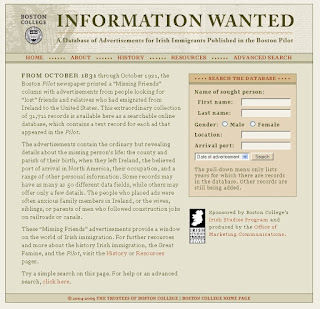 The Boston Pilot Newspaper printed a "Missing Person" column for family members that had lost contact with their lost friends and relatives that had immigrated from Ireland to the United States. The Boston Pilot ran column ran the column 90 years from October 1831 to October 1921. This project is sponsored by Boston College’s Irish Studies Program and produced by the Office of Marketing Communications. The ad collection of over 37,000 ads is a searchable database that provides valuable information for the missing person. The ads were extremely successful resulting in the distribution of the paper throughout the United States and overseas in Ireland and Australia. The column frequently includes the origination county and parish in Ireland, their occupation, the possible destination port, the person that placed the ad and up to 50 different items of interest, including work history and ships name to name just a few. This database is one that you will want to check out if you have Irish ancestry. Click here to go to this website.